Latest visualization of the startling decline of Arctic Sea Ice up to 2018, showing the minimum volume reached every September since 1979, set on a map of New York with a 10km grid to give an idea of scale. It is clear that the trend of Arctic sea ice decline indicates that it’ll soon be ice-free for an increasingly large part of the year, with consequences for the climate. The rate of ice loss in the Arctic is staggering. 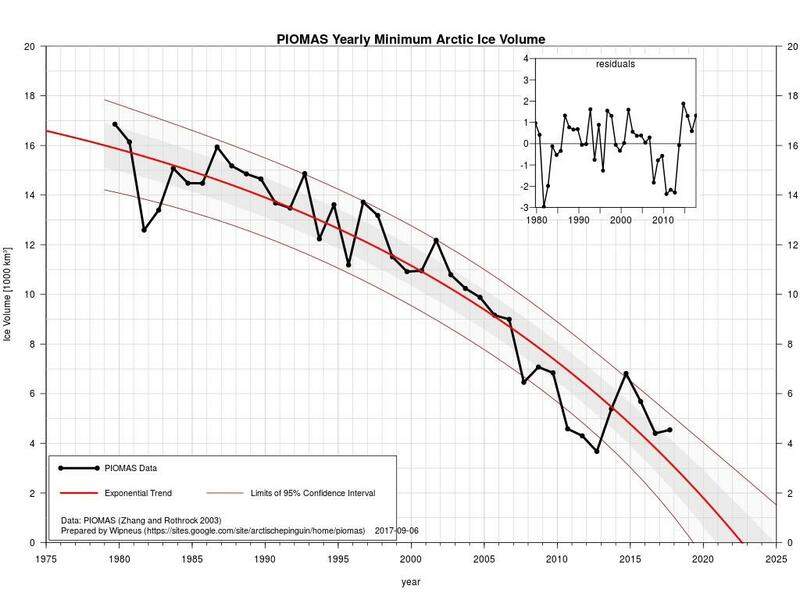 Since 1979, the volume of Summer Arctic sea ice has declined by more than 80% and accelerating faster than scientists believed it would, or even could melt. Beautiful piano piece. Scary visualization. Do you have sheet music? My son is a pianist and I think he might like to play it. That is a powerful graphic, Peter. And your music adds a beautiful sense of the tragic reality we are living to witness. Thank you. Oops…Sorry. Credit should go to Andy. Thank you, Andy! One of my favorite graphic representations of data—thank you, Andy. My other favorite on ice volume is this one—-music not as good, but gives a month-by-month view. Ah, but the line goes up in the last year. Recovery! Who says that? Tony Heller AKA “Steven Goddard”?